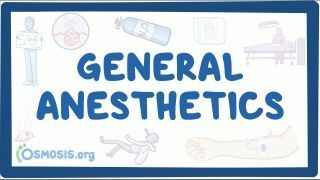 Osmosis: General anesthetics. (2019, April 24). Retrieved from (https://www.osmosis.org/learn/General_anesthetics). Ketamine (trade name Ketalar) is a medication mainly used for starting and maintaining anesthesia. It induces a trance-like state while providing pain relief, sedation, and memory loss. Other uses include for chronic pain and for sedation in intensive care. Heart function, breathing, and airway reflexes generally remain functional. Effects typically begin within five minutes when given by injection with the main effects lasting up to 25 minutes. Propofol (trade name Diprivan) is a short-acting medication that results in a decreased level of consciousness and lack of memory for events. Its uses include the starting and maintenance of general anesthesia, sedation for mechanically ventilated adults, and procedural sedation. It is also used for status epilepticus if other medications have not worked. It is given intravenously. Maximum effect takes about two minutes to occur and it typically lasts five to ten minutes. 2O. It is used in surgery and dentistry for its anaesthetic and analgesic effects. It is known as "laughing gas" due to the euphoric effects of inhaling it, a property that has led to its recreational use as a dissociative anaesthetic. It is also used as an oxidizer in rockets and in motor racing to increase the power output of engines. At elevated temperatures, nitrous oxide is a powerful oxidizer similar to molecular oxygen. Methoxyflurane is a halogenated ether that was in clinical use as a volatile inhalational anesthetic. Halothane (trade name Fluothane) is a general anesthetic that is inhaled. It is the only inhalational anesthetic containing bromine. It is colorless and pleasant-smelling, but unstable in light. It is packaged in dark-colored bottles and contains 0.01% thymol as a stabilizing agent. Isoflurane is a halogenated ether used for inhalational anesthesia. Together with enflurane and halothane, it replaced the flammable ethers used in the pioneer days of surgery. Its name comes from being a structural isomer of enflurane, hence they have the same empirical formula. Its use in human medicine is now starting to decline, being replaced with sevoflurane, desflurane, and the intravenous anaesthetic propofol. Isoflurane is still frequently used for veterinary anaesthesia. An inhalational anaesthetic is a chemical compound possessing general anaesthetic properties that can be delivered via inhalation. They are administered by anaesthetists (a term which includes anaesthesiologists, nurse anaesthetists, and anaesthesiologist assistants) through an anaesthesia mask, laryngeal mask airway or tracheal tube connected to an anaesthetic vaporiser and an anaesthetic delivery system. Agents of significant contemporary clinical interest include volatile anaesthetic agents such as isoflurane, sevoflurane and desflurane, as well as certain anaesthetic gases such as nitrous oxide and xenon. Enflurane is a halogenated ether. It was increasingly used for inhalational anesthesia during the 1970s and 1980s but is no longer in common use. What is the MOA of Propofol? A 67-year-old woman with cholelithiasis was scheduled for a cholecystectomy. On the day of surgery her Blood pressure is 160/95, heart rate 64 beats per min. Hematocrit 40 %, Hemoglobin 12.5 g/dl, serum sodium 142 mEq/L, serum potassium, 3.9 mEq/L. Her medications includes captopril and hydrochlorothiazide, all the medications are continued up to the day of surgery. Which of the following induction medications is most likely to make the patient's hypertension worse?